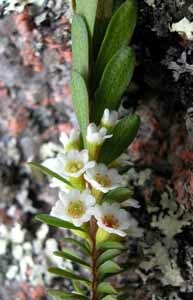 Tasmania has one native species of Thryptomene (T. micrantha). This is a small to medium sized shrub that is restricted to the Freycinet Peninsular and nearby regions. The leaves are flat, widest near the tip, opposite and decussate and aromatic. The flowers are in the axils of leaves just before the stem apex.